The period of 1890-ies was noted in the work of the master and the execution of large-scale custom-made works on interior design. 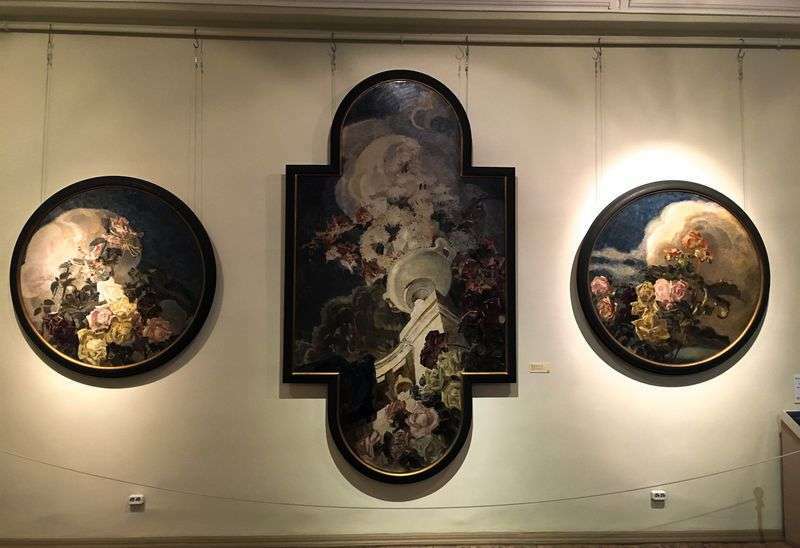 The collection of the Omsk Museum contains a wonderful example of Vrubel’s experiments in monumental and decorative art – the triptych “Flowers” for the Moscow mansion of Elena Dmitrievna Dunker. The spectacular composition, designed to solve the ceiling space, consists of picturesque panels: two round – “Roses and Lilies”, “Yellow Roses” and central – “Chrysanthemums”, the largest in size and complex in shape. This work clearly reveals the features of the artist’s talent: the originality of thinking and the ability to see beauty in the ordinary. Turning to one of the most common motifs in the art – the gifts of Flora, Vrubel offered his interpretation of the topic. The images he created are not so much beautiful and real flowers, as a poetic symbol of beauty, which Nature gives to the world. Naturally, the background for them the artist chose not the luxurious greenery of the evening garden, but the mysterious twilight of the lofty skies. A clear picture of exquisite colors likens them to the faces of crystal structures and at the same time is full of liveliness and movement. The nobility of restrained color, combined with the technique of applying colors in small, distinct strokes, gives the painting a resemblance to a mosaic of precious stones-a definition that became a textbook in the descriptions of the master’s creative handwriting. Vrubel makes a double discovery: in nature, unseen fantastic aspects are revealed by nature, and in the old “conventional” art – vitality and realism. Devotion to the real will remain the symbol of his faith until the end of the day. Just as he found his faceted crystalline forms in the structure of natural things, so he abducted his extraordinary colorful enchanting cascades in nature. He took them from azaleas, roses, orchids, irises, velvety-lilac clouds, which are at sunset, at the golden evening sky, near rocks and gems, at mother-of-pearl, plumage of birds, snow and water. NA Prakhov recalled: “The glitter of metal and especially the shimmering of the colors of precious stones have always attracted Vrubel. Description and meaning of the painting Triptych “Flowers” by Mikhail Vrubel.